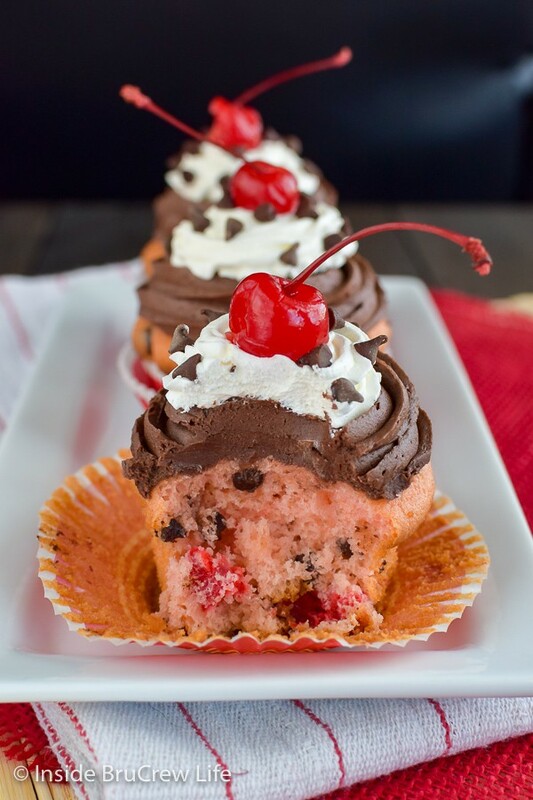 Cherries and chocolate add a fun surprise to these Cherry Chocolate Chip Cupcakes. Two kinds of toppings give these easy treats a fun bakery touch. Whenever we travel we look up different restaurants and bakeries to visit while we are there. We will usually buy a few things to sample. But honestly just stopping and looking at the treats is what I enjoy the most. There are so many different and fun ideas in those shops. If you ever see me in one of these shops, you might see me typing away on my phone. No, I’m not texting. That usually means I saw a unique flavor combo or decorating idea that I don’t want to forget to try in my kitchen. There are so many ideas swirling in my head that I just can’t remember all of them these days. Thank goodness for cell phones with list apps, right? I love baking fun cupcakes for different parties and events. 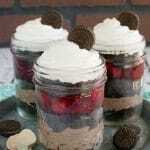 Now sometimes I will make them from scratch, but most of the time I like to use a cake mix. I am all about using some easy tricks to make a box cake mix taste homemade. 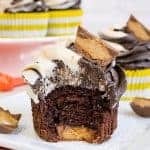 The fun part is finding things to add to these mixes that make the cupcakes taste gourmet, without adding a lot of extra work. 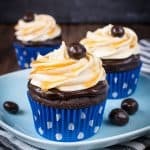 A doctored up cake mix makes an easy bakery style cupcake in a hurry! So when I was trying to decide on a new cupcake flavor for this month, I knew I wanted it to be some sort of chocolate and cherry combo. 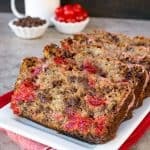 After all, this Cherry Chocolate Chip Banana Bread always makes me smile! 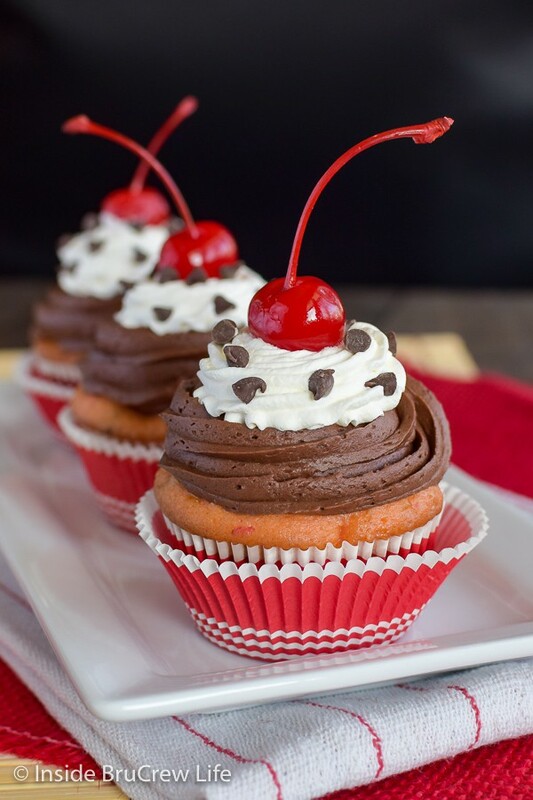 I do love those chocolate covered cherries that are only available in stores around Christmas and Valentine’s, so I knew that flavor would be delicious in cupcake form. Substitute some cherry juice with the water to give the vanilla cupcake a slight cherry flavor. Add diced maraschino cherries to the prepared cake mix. Make sure to pat them dry, so it doesn’t add extra liquid. 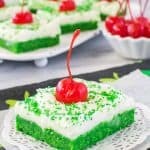 If you want them to have a stronger cherry flavor and to be a brighter pink or red, you can always add a little cherry extract and a drop of red food coloring. Stir a little bit of flour onto the cherries and chocolate chips. This will help keep them from sinking to the bottom of the cupcakes. Bake the cupcakes for 20-22 minutes and then remove and cool completely. 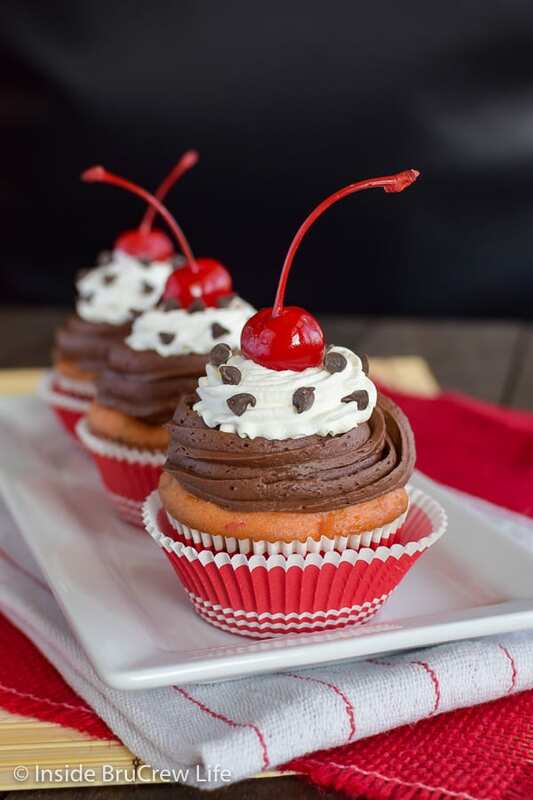 Add some fluffy homemade chocolate frosting, Cool Whip, chocolate chips, and a maraschino cherry to make this simple cherry cupcake look like an an over the top chocolate covered cherry cupcake! If you are a fan of dark chocolate, I recommend making a batch of this Dark Chocolate Buttercream Frosting! It’s my favorite. Make sure you do not over fill your decorating bags with too much frosting. You need enough room to twist the bag into the palm of your hand while holding it closed with your thumb and fingers. For these cupcakes I used a 1M tip. I piped the frosting on in a circle, but I didn’t mound it up. Use another icing bag filled with Cool Whip and icing tip 21 to add a smaller swirl on top of the frosting. 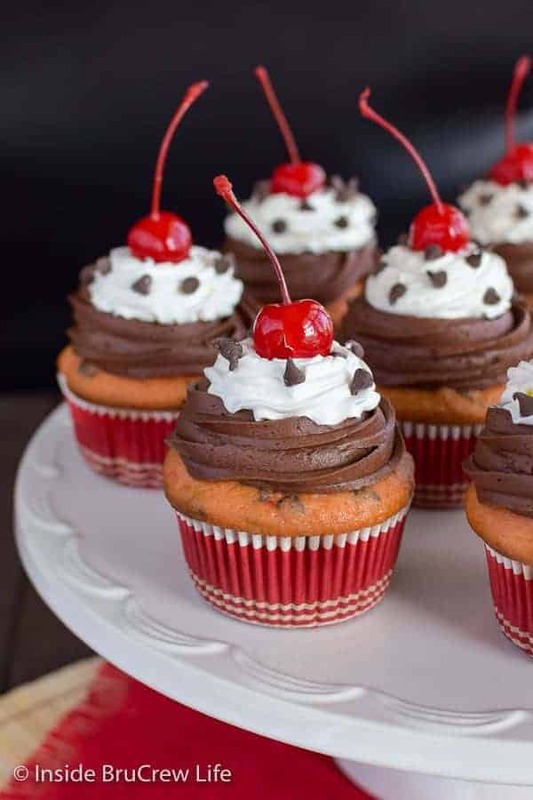 To give this cupcake the final touch, sprinkle on some mini chocolate chips and place a cherry with a stem on top. A cupcake with a cherry on top just looks so much fancier. Don’t they just look so much more fun with that stem coming off the top of the cherry cupcakes? Caramel drizzles, candies, and frosting give these Banana Caramel Cupcakes a delicious sweet and salty taste. A fluffy lemon frosting and a pocket of lemon filling makes these Lemon Coconut Cupcakes a bright and refreshing dessert! 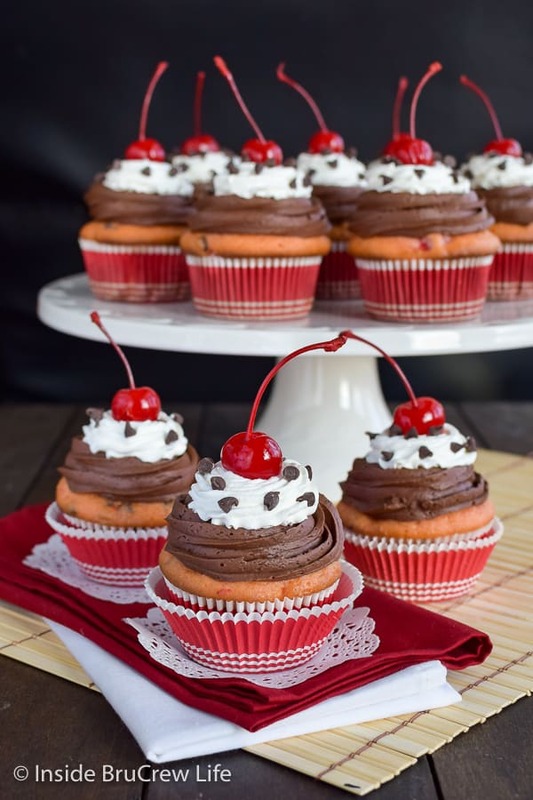 Sprinkles, hot fudge, and a cherry make these Hot Fudge Sundae Cupcakes so pretty. Preheat the oven to 325 degrees. Place 24 cupcake liners in 2 - 12 count muffin tins. Drain the cherries making sure to save the juice. Dice the cherries and pat dry with paper towels. Mix the cake mix, pudding mix, eggs, water, cherry juice, and oil in a large bowl until mixed completely. Stir together the diced cherries, chocolate chips, and flour until lightly coated. Add to the cake mix and stir in gently. Spoon the batter into the cupcake liners. Bake for 20-22 minutes. 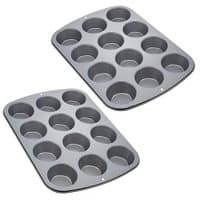 Remove the pan and place the cupcakes on a wire rack to cool completely. Beat the butter, shortening, vanilla, and salt until creamy. Slowly add the powdered sugar, cocoa powder, and heavy cream alternately until mixed in. Beat on high for a few minutes until light and fluffy. Place the chocolate frosting in an icing bag fitted with frosting tip 1M. Swirl a mound of frosting on top of each cupcake. Right before serving spoon the Cool Whip into another icing bag fitted with frosting tip 21 or 27. Swirl the Cool Whip on top of the frosting. Top with mini chocolate chips and a cherry with a stem. 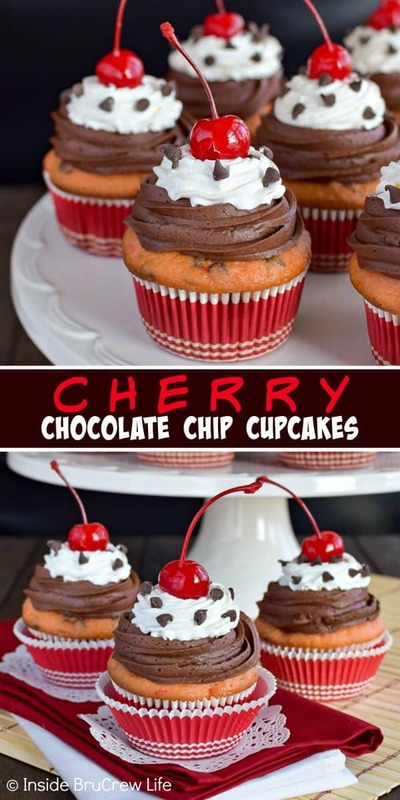 *The post for these Cherry Chocolate Chip Cupcakes was originally published on February 6, 2015. 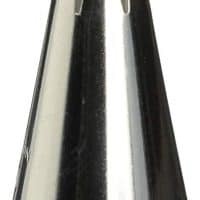 The pictures and post have been updated and republished on February 8, 2019. 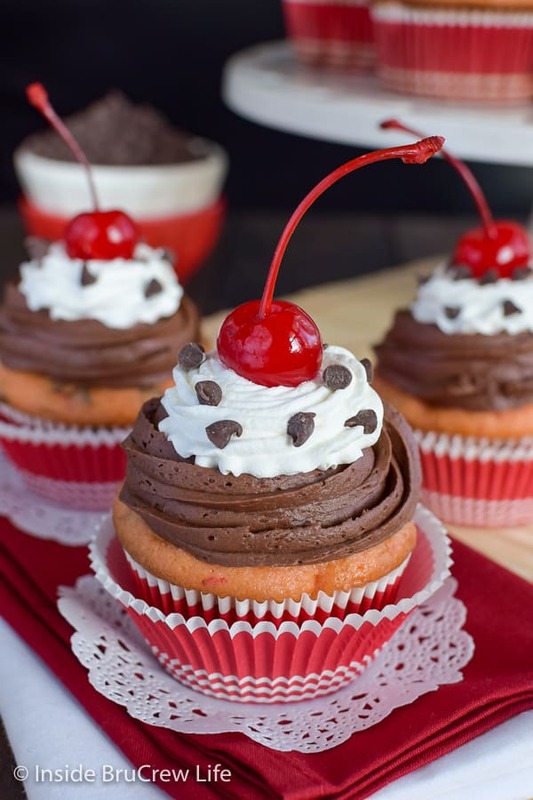 Chocolate and cherries go beautifully together and your cupcakes look gorgeous! How do I go about getting these cupcakes delivered to my front door?! They are perfect, Jocelyn! The cherry, chocolate chip combo make for a happy flavor dance! I would deliver them to you if I could…but my family devoured them! Well, since I’m pretty much obsessed with Cake Boss, I’m clearly going to check out the site. I even have the piping bags! This is a great flavor. It reminds me of an ice cream sundae! What a beautifully designed cupcake! I love the layered frosting (with the cherry on top). Thank you Erin. I had fun doing the layered frosting!!! Thanks girlie! Chocolate and cherry is such a good combo for sure! Very sweet and perfectly decorated cupcakes! That cupcake pan with the lid is great. Love that there is enough space so that the frosting won’t get smooshed. Thanks for sharing! These look perfect! I am horrible at frosting cupcakes for some reason and these look amazing! Love the cherry and chocolate combo. Pinned! These look amazing! I love the cherry on top. I want to go on vacations with you!! Visiting all of those bakeries sounds like heaven to me. And yes, I totally do the same thing by writing down flavor combos & copycats to try! 🙂 These cupcakes look absolutely gorgeous Jocelyn! Pinned! These cupcakes are dreamy!! Love everything, to the cherry on top! These cupcakes are so stinking cute! And I love the cherry and chocolate flavor combo – yum! Chocolate and cherries combo is my favorite! These are delicious but also the prettiest cupcakes ever! 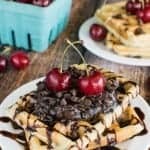 chocolate and cherries are such a classic flavor combo! These cupcakes did not dissapoint! so delicious! These are going on my valentines day menu! So yummy! Wow these cupcakes are SO delicious!